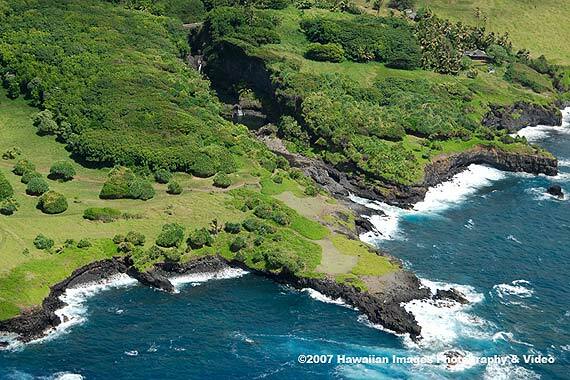 The road to Hana is Hawaii's most famous scenic drive. Waterfalls, the deep blue waters of the Pacific and thousands of shades of green define this beautiful region. This is the lush tropical scenery that many people envision when they think of Hawaii but don't see in the dry resort areas of Maui. There is no final destination along this highway although most choose either the town of Hana, or Haleakala National Park Kipahulu as their final turning point. There's a lot to explore - more than one can fit in a single day. The following guide covers the most interesting attractions and also mentions a few popular stops that should be skipped for single day excursions. iPhone users, be sure to download the Maui GPS Tour Guide. The app will point out all the stops. Prepare to start your journey early. Arrive in Pa'ia at 8am for a stop at Mana Foods, a most excellent health food store with great take out items. Remember to bring a cooler and stock up on plenty of food for the whole day. Being restricted to the choices on the highway will cramp your style. A road trip into the Hana region is a full day excursion. The further you drive, the more interesting the attractions become. If you were to drive without stopping it would take about 5 hours to drive the 110 miles all the way around this section of Maui. Including side roads, you may end up doing about 6-7 hours of driving. The main section of highway is nicely paved and easy to drive but demands constant attention as the road snakes its way along the coast in hundreds of twists and turns and crosses dozens of small bridges. The road continues past Hana and around the barren south side of Haleakala where it eventually finds its way back to Kahului. One should resist the temptation to approach the road like a mission where the goal is to do as much as possible. There is far too much to see in one day. At some point cramming in too much will start detracting from the experience. This is especially true if you're traveling with children. Haleakala National Park actually extends all the way from the top of the crater to the coast at a place called Kipahulu, a few miles beyond Hana. The Kipahulu section of Haleakala National Park is home to Maui's best hike and the Oheo Gulch, aka the "Seven Sacred Pools." If you're comfortable with a 12 hour day of exploring, we recommend Kipahulu as the final stop on your trip. It's about 10 miles south of Hana. One could spend 1 - 4 hours here. Then you have to decide whether to turn back, or drive all the way around the south coast. A little over 2 miles south of Kipahulu the road starts to deteriorate. For about 10 minutes it becomes a sketchy single lane road that's drivable but a little scary because it's narrow and beside some cliffs for part of the way. Fortunately there isn't much traffic. After that there's an intermittent dirt road that lasts for 15 minutes. Then comes a paved road that's been repaired an inconceivable number of times making it terribly bumpy. That section is a little over 8 miles in length but you'll be driving it so slowly it will take almost an hour. The remainder of the highway is smoothly paved. The highway goes up to Kula on the slopes of Haleakala, and then back down to Kahului. The driving time is about the same whether you turn back at Kipahulu or continue on. The scenery on the backside of Haleakala is very different than what you would have seen up to this point. It's dry and unpopulated, but still beautiful with vast vistas of open space. The sun will be setting as you drive along the highway heading west now, which could also add some magic (you don't want to do this drive at night). However, the road's bumpiness is very unpleasant. Also, should your car break down here for some reason, the cost to get it towed will be astronomical. Our recommendation is to ask the ranger's at the national park about current road conditions. Provided the weather is good and you're not leaving Kipahulu too late, continue along the road. You'll also want to check with your car rental company about their policy for driving the road. You don't need a 4wd. We don't recommend doing the Hana highway in the reverse direction. The highway is most beautiful in the morning with the sun shining on the trees, and it's less likely to be raining. Pa'ia town is a great place for tourist shopping but when exploring the Hana highway save Pa'ia for another day. Stock up on supplies at Mana Foods on Baldwin Avenue, then fill up on gas, and hit the road. Twin Falls is the first stop on the road to Hana, as such many people do stop here. A fruit stand and large parking area welcome visitors. Trails through the jungle lead to several small waterfalls and pools. The trails are actually on private land but the owners allow access, asking for donations to maintain the area for visitors. It takes about an hour to explore the area. Many visitors make the mistake of taking photos of the first waterfall and then leaving. You should either fully commit to stopping here, enjoying all that Twin Falls has to offer, or skip it altogether. A second popular waterfall is about half a mile past the first. We don't recommend stopping at Twin Falls unless you're only planning on driving a small portion of the Hana highway. In that case this is a pleasant stop. This is a pretty 0.8 mile nature trail that takes you through a lush forest of bamboo, eucalyptus and other vegetation, with a couple scenic overlooks. You can walk the smaller loop portion of the trail which only takes ten minutes, or do the entire trail which will take about 40 minutes, ending at a picnic site with nice views (there are no restrooms). The trail is quite popular and so the small parking area is often full. Ordinarily, this would make for a pleasant walk in the forest, but once again this is a stop that we recommend skipping if you're planning a full day along the Hana highway. There are simply too many other hiking opportunities. The modestly named Garden of Eden botanical garden is a private garden that's open from 8am to 3pm and costs $15 per person. If you haven't specifically planned to visit the garden we don't recommend the diversion. This is a brief stop that requires you walk for a couple minutes to get a view of the distant but impressive Lower Puohokamoa Falls. Like many Hana attractions the location is unmarked and difficult to find. Technically it's possible to hike to the waterfall but the path is too dangerous to attempt this. Even as you walk the short distance to the viewing area, keep an eye on children - the path is often slippery and there are dangerous spots. This is a recommended stop but the land owner may be fickle when it comes to granting access. Please observe any posted signs if they have decided to bar access. Haipua'ena Falls is the perfect example of the Road to Hana Lemmings Effect. Tourists who haven't planned ahead and don't know the location of the stops follow each other to every possible attraction. Perhaps it's a result of guide books trying to out-do each other by highlighting the most trivial attractions. In any event, don't let this waterfall distract you from the more interesting stops. Kaumahina Park has nice coastal views and is a good place for a bathroom break. From November through April you may spot whales from the park's lookout. You don't need to spend more than 15 minutes here. As you drive toward Hana you'll get glimpses of Honomanu Bay from the highway (just past Kaumahina Wayside Park). There's a difficult to spot road that leads to the Bay. Although the views from the Bay are pretty, the swimming is poor because it's rocky. We recommend taking in the views from the vantage points on the highway. It's probably a 25 minute diversion if you decide to visit. If it's been raining hard the dirt road may be in poor shape. Ke'anae is a small coastal village with a couple snack shops, an old church, and beautiful coastal views. The 30 minute detour is recommended. Like many sections along the fertile coast this area has been inhabited by Hawaiians for hundreds of years. In 1946 a massive Tidal wave from an earth quake originating in the Aleutian Islands, more than 2000 miles away, hit Hawaii. The waves sweeping over this village would have been 24ft - 30ft high. Waves from Tsunami's aren't the same as those you see when people surf in giant swells. Tsunamis are more like an unstoppable wall of water. Everything was destroyed except for the church dating from 1856. 2 people were killed. In total 14 Maui residents died in the 1946 Tsunami, 12 of which were along the Hana coast. This is a six acre garden with about 150 varieties of plants and several trails through the garden. Horticulturists will find the garden interesting since most of the plants are labeled and there are some unique species. The arboretum is owned by the state and entry is free, but the area isn't maintained regularly so those expecting a pristine botanical garden won't be impressed. This is a recommended stop for plant lovers that will take about 30 minutes. Mosquito repellent is recommended. If looking at different varieties of Taro and Banana tree don't excite you, other spots on the Hana highway provide more traditional scenic beauty. Several guide books talk about swimming in Ching's Pond, just past Ke'anae. The farmers in Ke'anae rely on this as a water source and have erected a no trespassing sign. They don't want the water contaminated. Also, jumping into the pond from the platform beside the bridge is dangerous, especially if you haven't examined the underwater topography which includes rocks. This is one of the main viewing waterfalls along the Hana highway. Provided you can find parking, there's a path the goes from the Hana side of the bridge to the waterfall for a nice vantage point. Pua'a Ka'a Wayside Park is another good place to stop for a bathroom break. The park features a modest waterfall and swimming hole but we don't recommend swimming here as the water tends to be quite dirty. Hanawi Falls is an easy to spot waterfall as you cross one of the Hana highway's 59 bridges. There are a couple parkings spots before and after the bridge. This waterfall is located directly underneath a bridge. A few parking spots are located on the Hana side of the bridge. You have to get out of your car and peer over the railing to see the waterfall. Nahiku is a small community near Hana. Hidden for many years, today the road through Nahiku gets a lot of attention in various guide publications. As lush and tropical as the Hana highway is, the road through Nahiku to the coast is even more so. This region averages 200 inches of rain per year. Understandably, some residents haven't been thrilled with all the resulting traffic. The last section of road which leads to the ocean is on private property and may be closed off to non residents. The slow drive down Nahiku road is about a 30 minute detour. Even without the above considerations it's not a diversion we would recommend for a single day Hana excursion: There are many equally beautiful coastal views from Ke'anae Peninsula, Wai'anapanapa State Park, and Kahanu National Tropical Botanical Garden. And the Hana highway is already the definition of lush tropical. The residents have taken down the street sign so the turn-off is difficult to find. Nahiku Marketplace is a group of road side stands that sell coffee, tea, fish, baked bread fruit, coconut candy and other snacks. If you're hungry when you reach this point stop for something to eat as there aren't many options in Hana, and there are two big stops before Hana town so your ETA is likely a couple hours from this point. Kahanu National Tropical Botanical Garden is the home of Pi'ilanihale, the largest ancient temple in Hawaii. This is a recommended stop if you're in time to visit and don't mind paying the $10 per person fee for adults 13 and older. The garden walk is only half a mile and can be done in half an hour, although you'd probably want to spend a little more time here. The coastal views from here are lovely, but the main attraction is the temple remains, not the garden. Archaeologists believe Pi'ilanihale Heiau was built in several stages, possibly starting in the 13th century with major construction commencing in the 16th century, coinciding with the rule of the Pi'ilani family of chiefs. Pi'ilanihale translates to house of Pi'ilani. Although Pi'ilanihale Heiau is the largest and most impressive temple in Hawaii, it's omitted from Hawaiian oral history. It is thought that talking about the temple was made a Kapu in the 17th century, following a bitter rivalry between the two sons of King Pi'ilani. One of the sons eventually vanquished the other, and put a Kapu on any talk of his brother, or the home he used to live in, which was the Temple. Hawaiians living in the area confirm that their parents and grandparents forbid them to approach the area. As such the temple was consumed by the jungle and mostly forgotten until the 1960s, when an archeological expedition cleared the area and the site became a national historic landmark. The garden is open 10am to 2pm Monday through Friday. Even if you arrive just before 2pm, you'll be allowed to explore until 3. This is a recommended stop along the road to Hana. The State park features blowholes, sea arches, caves, a black sand beach, and a couple excellent coastal hikes along the remnants of the old King's Highway. In the 16th century, a chief by the name of Pi'ilani unified east and west Maui to become the first ruler of the entire island. He started a massive construction project called the King's highway, a 4 to 6 feet wide rock paved trail that encircled the entire island. Only a few sections of the King's highway remain including the section at Wai'anapanapa State Park. From the park you can hike either north or south east along the coast. The northern trail is about a mile one way, ending at the Hana airport runway. The southern trail goes all the way to Hana Bay and is 3.5 miles one way. On this trail you'll pass the Ohala Heiau and several other unmarked archaeological sites (tread lightly). The black sand beach at the park is interesting to look at but too rocky for comfortable sun bathing. The ocean here tends to be rough with strong currents year round so swimming is not advised. The caves are located nearby the black sand beach. There's a blowhole on the rocks nearby the sea arch. You'll hear all sorts of hissing sounds as water channels through tunnels under the rocks. It takes really big surf for this blow hole to shoot water. Keep a close eye on children on the rocks here, there are several places, including the blowhole, where they could fall into the ocean. It's easy to spend many hours at the park if you enjoy hiking. If you're doing a 1 day trip to Hana and your destination is the Kipahulu section of Haleakala National Park (i.e. the Oheo gulch), we recommend you not spend too much time here, and rather spend your hiking time on the Pipiwai Trail at Kipahulu. However, if Hana town is your final destination we recommend you invest more time here. Red Sand beach is one of the most unusual and interesting beaches in Hawaii. The beach has been carved into the side of a steep cinder cone. Lava rocks create a natural pool and provide some protection against the otherwise dangerous ocean. The contrast between the deep blue water and shades of red sand and soil create an otherworldly scene. Unfortunately this beach is not easy to access. You have to be comfortable walking on steep slippery dirt, and capable of climbing up a 3ft high lava rock (shelf). A small section of the path is very narrow and a slip would be catastrophic. If you accidentally take the wrong path (the old path that disappeared in a land slide) you could put yourself in danger since the path seemingly vanishes. The path is not recommended for children. The parking is just before the entrance to a section of the Hotel Hana Maui's Cottages. To find the beach path, you walk about 40 yards through the Children's Center field (it looks like a school). Then look for a path that cuts through the brush. Now, make your way down to the ocean at the first opportunity. Do not attempt to walk around the hill, since that path has deteriorated. You'll walk along the rocks beside the ocean for maybe 100 ft, then climb up the lava bench, and walk along the rocks for another 100 - 200 ft until you see the dirt path on the side of the hill. The rest will be obvious. The ocean here could be very dangerous. Only a resident who frequents this area throughout the year will be able to give you sound safety advice. If the waves are crashing on the rocks where the path is, you should turn back. Check the surf report to get an idea of what may be possible for any given day. You may see locals jumping off some rocks into the ocean. We don't have enough experience to give you sound advice about this location, but our instincts tell us the ocean and currents are too dangerous for this to be safe. 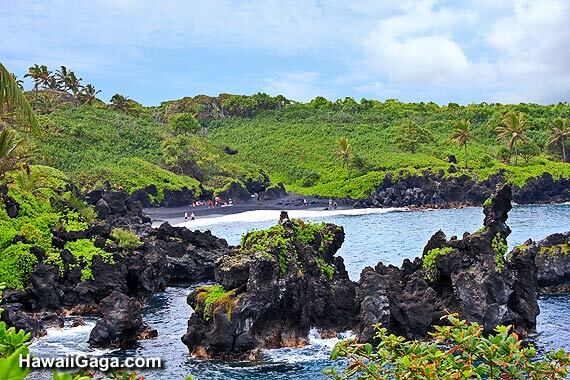 For a beach break on the road to Hana plan on visiting Hamoa beach. But be careful. The surf at Hamoa beach is often rough, breaking abruptly on the beach. The area is also prone to strong currents and exposed to open ocean and large waves. If conditions aren't calm don't try and swim here. Among the waterfalls you pass on the Hana highway Wailua Falls is perhaps the most impressive depending on recent rainfall. This 80ft high waterfall is located 7 miles past Hana. There's a reasonable amount of parking across the bridge and sometimes roadside vendors selling items. You'll stop for perhaps 10 minutes here to take photos. It's possible to walk to the base of the waterfall but the path is slippery and difficult to navigate. You may read about Waioka Pool (aka Venus Pool) in some guide books. Unfortunately it's not possible to get to this pool without walking over private property, and the land owner has not granted access. Skip this location and instead spend your time at Ohe'o Gulch (aka the Seven Sacred Pools). 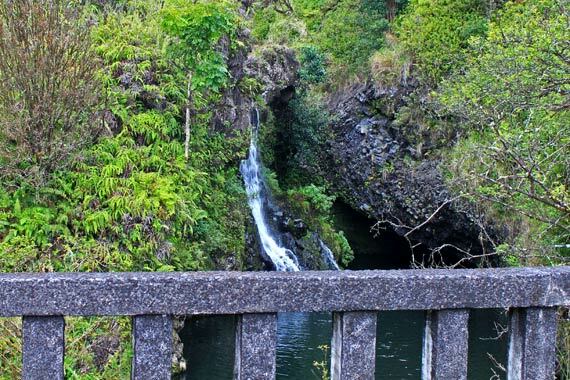 The Oheo Gulch, cleverly re-branded as the seven sacred pools by local industry to draw tourists, is a series of cascading pools within Haleakala National Park Kipahulu. The pools are a favorite swimming spot but the rangers do close the Pool when there is the slightest risk of flash flooding. They apparently also test the waters for Leptospirosis (see below). 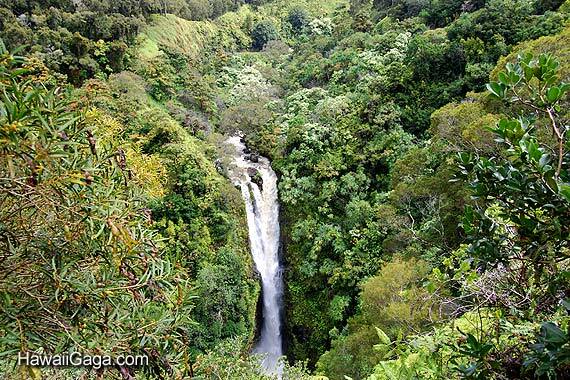 This is one of the best hikes on Maui. If you're doing a one day trip on the Hana highway and enjoy hiking, this is your final destination. The Pipiwai Trail is at the Kipahulu section of Haleakala National Park. Signs at the park will point out the trail head, and the rangers will be able to give you detailed information about the hike, current conditions etc. The trail is less than 4 miles in length and takes approximately 2.5 hours if you don't stop too often. If time is an issue, consider hiking the first 2/3 of a mile to Makahiku falls. The trail ends at the impressive 400 ft high Waimoku falls. On the road to Hana there are several places where you can swim in fresh water streams. Before you decide to swim in fresh water, you should be aware of Leptospirosis, a tropical bacterial disease that causes fever and other flu like symptoms. In 10% of cases the illness causes severe complications like meningitis or liver failure. Roughly 1% of cases result in death. Hawaii averages about 44 confirmed cases per year, and many more go undiagnosed as people assume they have the flu or another virus. The disease is spread from animals to humans via contaminated urine. The most common transmission media is fresh water – streams and ponds or muddy or wet soil. The bacteria can survive for a long time in moisture, but die after a few hours in salt water. If you decide to swim in fresh water pools make sure all cuts are covered with water-tight bandages and keep your head above water. The easiest entry point for the bacteria are your eyes, nose and ears. Remember that standing under a waterfall can be dangerous - you can be hit by falling debris and rocks. Heavy rains in the mountains can also result in flash flooding despite skies being clear at your location. Be cautious of hiking up apparently calm stream beds. You need to be fully aware of the weather forecast for the region, paying careful attention to the risk of flash floods.